If you follow any of my social media channels, you may have noticed a few posts lately mentioning the new Joey Gerard’s Supper Club restaurants. As you are probably aware, each Bartolotta restaurant offers a unique venue and atmosphere that only Joe’s vision could have created. His two new supper clubs continue that fine tradition. Fortunately, I was priviledged to pay a visit to both locations recently, courtesy of a special invite to a @MKEFoodies event (which, by the way, offered a behind the scenes look, which was super cool! 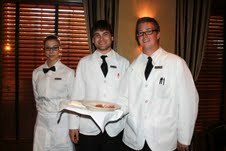 ), and compliments of a Preview Dinner this past weekend at the new Mequon location. Entering each restaurant was truly a jump back in time. Rich, dark woods, classic accent lighting, and attentive staff were just a few starting points as to why I personally enjoyed the experience. Of course the main reason many pay a visit is for the marvelous food offered. Joe’s kitchen staff does not disappoint. Sitting down to one of his meals exposes your taste buds to seared meats grilled to perfection over charcoal, full flavored sauces, delicate seafood and creative desserts. All are sure to have you craving for more and entice you to return! Though the food was tasty, and the atmosphere warm and inviting, I found it was truly the staff that helped bring the evenings together. From the hostess greeting and seating us, to the servers accommodating our every request, everyone – and I mean everyone – was gracious, kind, and attentive to our needs. Those details mattered, and my wife Carrie and I appreciated it tremendously. Honestly, both dining experiences reminded me at a core level about what is learned in Sunday School, as teachers relate to children that God wants us all to feel special and blessed. After the two meals at Joey Gerards, I can confirm the owners and staff strive to have diners feel appreciated during their visits. My compliments to all. Well done. Please note: I’m not a dining critic, nor was I under any obligation to promote this restaurant. I received no additional perks for promoting Joey Gerard’s Supper Club. I’m merely expressing my opinion based on my experiences. Please comment, share or retweet if you enjoyed reading my post!